Azacitidine has become an available therapy for high-risk myelodysplastic syndromes. Infectious complications (IC) may impede the success of therapy. Since most patients are managed in an outpatient setting, often with low level of clinical and microbiological documentation, the impact of IC remains unclear. We retrospectively evaluated the clinical course of 77 patients with MDS treated with azacitidine between 2004 and 2015 (median age 69 years). Clinical workup included severity and type of IC, days in the hospital and with antimicrobial therapy, response to azacitidine, and overall survival (OS). In total, 614 azacitidine cycles were administered, 81 cycles with at least one IC. The median number of administered cycles was 6 (range 1–43). Median OS after the start of azacitidine was 17 months (range 1–103). Infection rates were higher in the first 3 cycles with bacterial infections leading. The better patients’ hematological response to azacitidine with less IC occurred, and fewer days with antimicrobial treatment were needed. Compared to progressive disease, stable disease made no significant improvement in occurrence of IC and days in the hospital. Older age was associated with more IC and longer time in the hospital. Comorbidities or IPSS-R had no influence on IC. 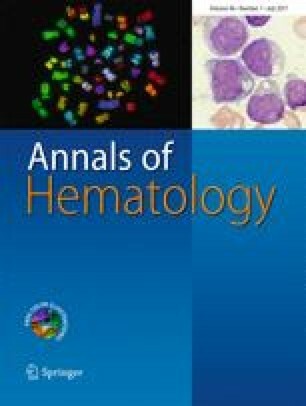 The incidence of IC correlated with hematological response and age. Stable disease led to longer OS, but incidence of IC was comparable to progressive disease and survival seemed to be bought by a considerable number of IC. IC rates were highest in the first 3 cycles. We recommend response evaluation after 4–6 cycles. Anna Schuck: Financial travel support from Celgene. Judith Neukirchen: Financial travel support and speakers honorarium from Celgene. Andrea Kündgen: Financial travel support from Celgene. Thomas Schroeder: Financial travel support, research funding, lecture fees from Celegene. Guido Kobbe: Research funding, financial travel support and lecture fees from Celgene. Ullrich Germing: Speakers honorarium from Celgene, Janssen-Cilag, Novartis, Research support Celgene, Novartis.